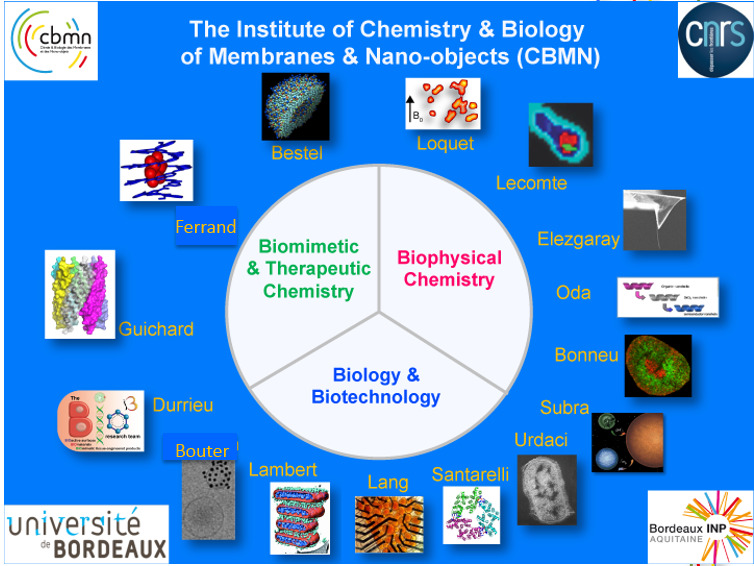 The institute of Chemistry and Biology of Membranes and Nano-objects (CBMN, UMR5248) is an institute belonging to CNRS, University of Bordeaux and to the Bordeaux Aquitaine National Polytechnic Institute. It is multi-disciplinary and operates at the interface between Chemistry, Biology and Physics by hosting 15 research laboratories distributed in three departments: Biomimetic and Therapeutic Chemistry, Biophysical Chemistry and Biology and Biotechnology. 9 Technical Platforms (NMR, X-Rays, Electron Microscopy, Mass spectrometry, Vibrational spectroscopy (IR-Raman-BA-PWR), Molecular Modelling, AFM, peptide synthesis, recombinant protein production) nicely complement the high level expertise of research laboratories. More than 200 people work at CBMN, half of them having a permanent position in one of the main trustees or in the associated trustee, Bordeaux Science Agro. CBMN is part a national plan called “Invest to the Future”: IDEX Bordeaux, Labex AMADEUS, VIBNANO and LISA Carnot Institute. It is also part from France-Japan Laboratoire International Associé (LIA) on “Chiral Nanostructures for Photonic Applications” (CNPA). A close partnership is particularly developed with pharmaceutical and formulation industries and also with industries in the nutrition and health domains (lipids and vine/wine products). Its mission is to promote basic knowledge on chemical and biological complex phenomena by explorations at several spatial and time scales, from molecules to cells and organisms, and from picosecond to hours. Besides basic science, such as foldamers and chemical or biological nanoassemblies, the institute also develops applied science towards bio- and nano-chips, biomaterials, drug delivery, nutrition and industrial colloids, cell adhesion, bacterial probiotics, diabetes and main diseases. The institute is heavily involved in the training of students from the University of Bordeaux in the colleges of Physics, Chemistry, Biology, Pharmacy and Medecine. It is also involved in the training of engineers in the INP Bordeaux Aquitaine at ENSCBP and ENSTBB as well as in Bordeaux Sciences Agro (BSA).